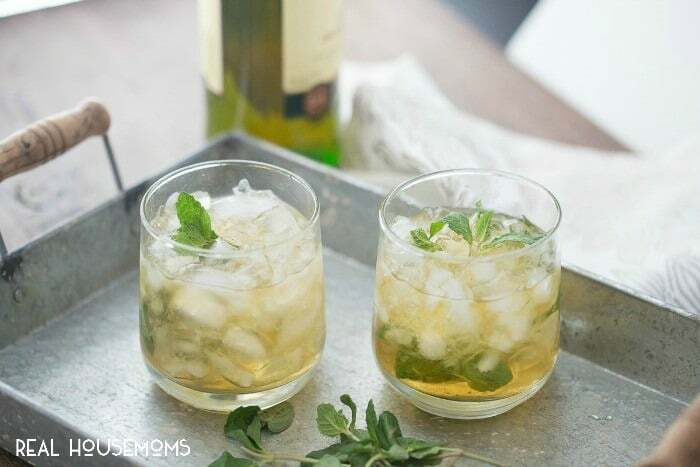 Our IRISH JULEP is a delicious twist on a classic cocktail that’s perfect for St. Patrick’s Day! I am not one to go crazy over all the holidays, well with the exception of Christmas. I go bonkers over Christmas! I decorate the heck out of the house and the tree. It’s the other holidays I’m talking about. I have friends up who not only do up their houses, but they themselves dress for each holiday. Pink for Valentine’s Day, Orange (with pumpkins) for Halloween, and lots of green for St. Patrick’s Day. I don’t even own orange or green clothes! While dressing for holidays may not be my thing, making food and drinks for each holiday most certainly is! This St. Patrick’s day, I’ll be making these fudgy and rich Irish Cream Brownies and probably these Guinness Black Bottom Mint Cupcakes. Then I’ll wash BOTH down with this golden and delicious beverage! This, my friends is an Irish Julep! 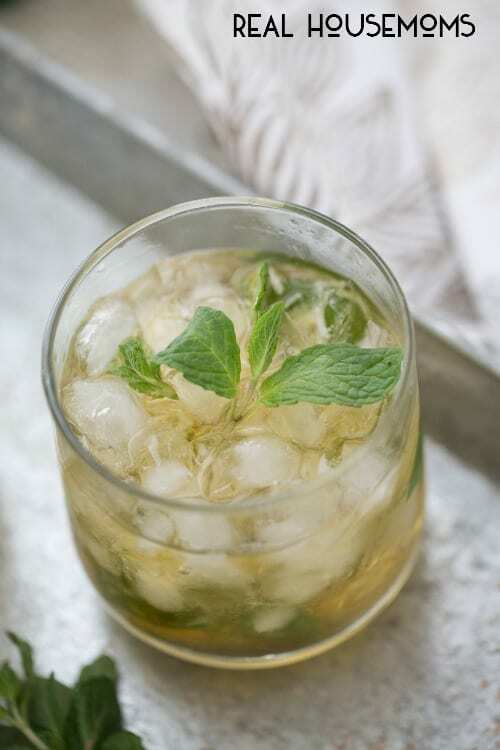 Traditionally, juleps are made with bourbon, crushed ice and muddled mint leaves. To give this cocktail and Irish spin, I substituted the bourbon for Jameson Irish Whiskey. There are still lots of mint leaves, but because I need my drinks to have a little sweetness, I added simple syrup to these drinks. My simple syrup is made with equal parts water and sugar that are boiled together until the sugar has dissolved and the mixture thickens ever so slightly. This recipe yields enough syrup for two cocktails; you may have to adjust the syrup amount according to your needs. Prepare the simple syrup by adding the sugar to the water in a medium saucepan. Boil on low heat until the sugar has dissolved and syrup has thickened slightly. Remove and let cool. Place an ounce of sugar in two cocktail glasses. 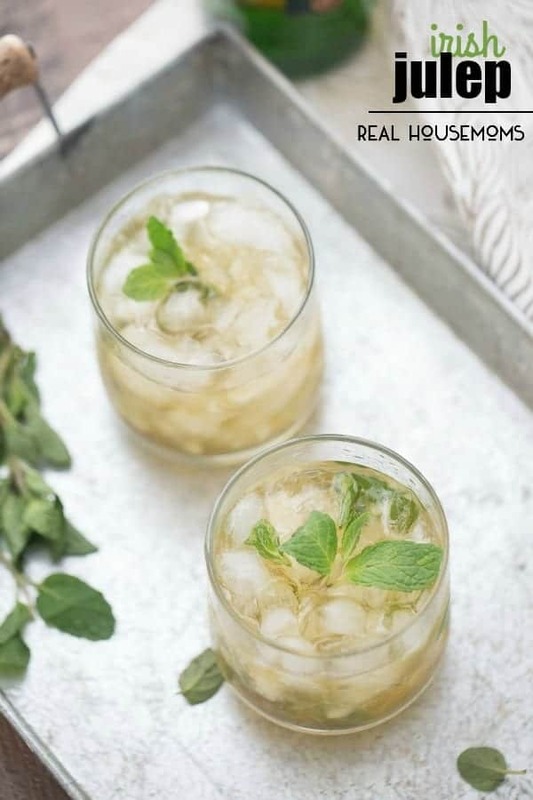 Place 5-7 mint leaves in each glass and crush with the back of a wooden spoon. Add 1 1/2 ounces of whiskey to each glass and top with a little crushed ice; stir. Top each glass with another 1 1/2 ounces of whiskey and more crushed ice. Serve.